In this first part, we will describe the basic mechanics of our application and undertake data modeling. In the second part, we will create tests that validate the behavior of our application and then describe how to set-up and run the application. Let’s begin by defining the MEAN stack. M = MongoDB/Mongoose.js: the popular database, and an elegant ODM for node.js. E = Express.js: a lightweight web application framework. The MEAN stack is a modern replacement for the LAMP (Linux, Apache, MySQL, PHP/Python) stack that became the popular way for building web applications in the late 1990s. In our application, we won’t be using Angular.js, as we are not building an HTML user interface. Instead, we are building a REST API which has no user interface, but could instead serve as the basis for any kind of interface, such as a website, an Android application, or an iOS application. You might say we are building our REST API on the ME(a)N stack, but we have no idea how to pronounce that! REST stands for Representational State Transfer. It is a lighter weight alternative to SOAP and WSDL XML-based API protocols. POST: A client wants to insert or create an object. GET: A client wants to read an object. PUT: A client wants to update an object. DELETE: A client wants to delete an object. These operations will become clear later when define our API. 201 - “Created” (Used with POST). 400 - “Bad Request” (Perhaps missing required parameters). 401 - “Unauthorized” (Missing authentication parameters). 403 - “Forbidden” (You were authenticated but lacking required privileges). A complete description can be found in the RFC document, listed in the resources section at the end of this blog. We will use these result codes in our application and you will see some examples shortly. Why Are We Starting with a REST API? Developing a REST API enables us to create a foundation upon which we can build all other applications. As previously mentioned, these applications may be web-based or designed for specific platforms, such as Android or iOS. Today, there are also many companies that are building applications that do not use an HTTP or web interface, such as Uber, WhatsApp, Postmates, and Wash.io. A REST API also makes it easy to implement other interfaces or applications over time, turning the initial project from a single application into a powerful platform. In this blog series we will focus on building the REST API, and we will not cover the intricacies of RSS feeds. However, code for Feed Grabber is available in a github repository, listed in the resources section of this blog. An in-depth discussion on data modeling in MongoDB is beyond the scope of this article, so see the references section for good resources on this topic. Let’s take a closer look at each of these collections. If you are familiar with relational database technology, then you will know about databases, tables, rows and columns. In MongoDB, there is a mapping to most of these Relational concepts. At the highest level, a MongoDB deployment supports one or more databases. A database contains one or more collections, which are the similar to tables in a relational database. Collections hold documents. Each document in a collection is, at a highest level, similar to a row in a relational table. However, documents do not follow a fixed schema with pre-defined columns of simple values. Instead, each document consists of one or more key-value pairs where the value can be simple (e.g., a date), or more sophisticated (e.g., an array of address objects). Our JSON document above is an example of one RSS feed for the Eater Blog, which tracks information about restaurants in New York City. We can see that there are a number of different fields but the key ones that our client application may be interested in include the URL of the feed and the feed description. The description is important so that if we create a mobile application, it would show a nice summary of the feed. The remaining fields in our JSON document are for internal use. A very important field is _id. In MongoDB, every document must have a field called _id. If you create a document without this field, at the point where you save the document, MongoDB will create it for you. In MongoDB, this field is a primary key and MongoDB will guarantee that within a collection, this value is unique. Again, we can see that there is a _id field. There are also some other fields, such as description, title and summary. For the content field, note that we are using an array, and the array is also storing a document. MongoDB allows us to store sub-documents in this way and this can be very useful in some situations, where we want to hold all information together. The entryID field uses the tag format to avoid duplicate feed entries. Notice also the feedID field that is of type ObjectId - the value is the _id of the Eater Blog document, described earlier. This provides a referential model, similar to a foreign key in a relational database. So, if we were interested to see the feed document associated with this ObjectId, we could take the value 523b1153a2aa6a3233a913f8 and query the feed collection on _id, and it would return the Eater Blog document. A user has an email address, first name and last name. There is also an sp_api_key_id and sp_api_key_secret - we will use these later with Stormpath, a user management API. The last field, called subs, is a subscription array. The subs field tells us which feeds this user is subscribed-to. The last collection allows us to map users to feeds and to track which feeds have been read. We use a Boolean (true/false) to mark the feed as read or unread. Mark feeds/entries as read or unread. Additionally, a user should be able to reset their password. The following table shows how these operations can be mapped to HTTP routes and verbs. In a production environment, the use of secure HTTP (HTTPS) would be the standard approach when sending sensitive details, such as passwords. In robust real-world applications it is important to provide user authentication. We need a secure approach to manage users, passwords, and password resets. There are a number of ways we could authenticate users for our application. One possibility is to use Node.js with the Passport Plugin, which could be useful if we wanted to authenticate with social media accounts, such as Facebook or Twitter. However, another possibility is to use Stormpath. Stormpath provides User Management as a Service and supports authentication and authorization through API keys. 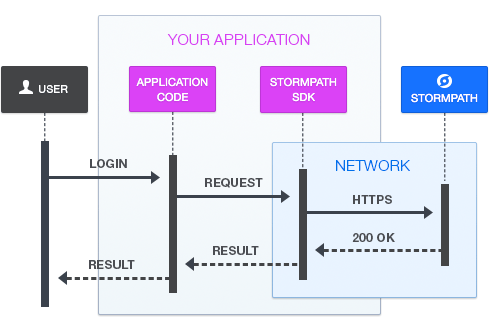 Basically, Stormpath maintains a database of user details and passwords and a client application REST API would call the Stormpath REST API to perform user authentication. The following diagram shows the flow of requests and responses using Stormpath. In detail, Stormpath will provide a secret key for each “Application” that is defined with their service. For example, we could define an application as “Reader Production” or “Reader Test”. This could be very useful when we are still developing and testing our application, as we may be frequently adding and deleting test users. Stormpath will also provide an API Key Properties file. Must have >= 8 characters. Must include lowercase and uppercase. Stormpath keeps track of all of our users and assigns them API keys, which we can use for our REST API authentication. This greatly simplifies the task of building our application, as we don’t have to focus on writing code for authenticating users. Node.js applications are built using many library modules and there is a very rich ecosystem of libraries available, some of which we will use to build our application. To start using Node.js, we need to define a package.json file describing our application and all of its library dependencies. The Node.js Package Manager installs copies of the libraries in a subdirectory, called node_modules/, in the application directory. This has benefits, as it isolates the library versions for each application and so avoids code compatibility problems if the libraries were to be installed in a standard system location, such as /usr/lib, for example. The command npm install will create the node_modules/ directory, with all of the required libraries. Our application is called reader-api. The main file is called server.js. Then we have a list of the dependent libraries and their versions. Some of these libraries are designed for parsing the HTTP queries. The test harness we will use is called frisby. The jasmine-nodeis used to run frisby scripts. One library that is particularly important is async. If you have never used node.js, it is important to understand that node.js is designed to be asynchronous. So, any function which does blocking input/output (I/O), such as reading from a socket or querying a database, will take a callback function as the last parameter, and then continue with the control flow, only returning to that callback function once the blocking operation has completed. Let’s look at the following simple example to demonstrate this. In the above code, we are guaranteed that function two will only be called after function one has completed. It helps the developer really understand how data and functions are consumed and often exposes subtle needs like the ability to return 2 or more things in an array instead of just one thing. By writing tests before building the application, the paradigm becomes “broken / unimplemented until proven tested OK” instead of “assumed to be working until a test fails.” The former is a “safer” way to keep the code healthy.